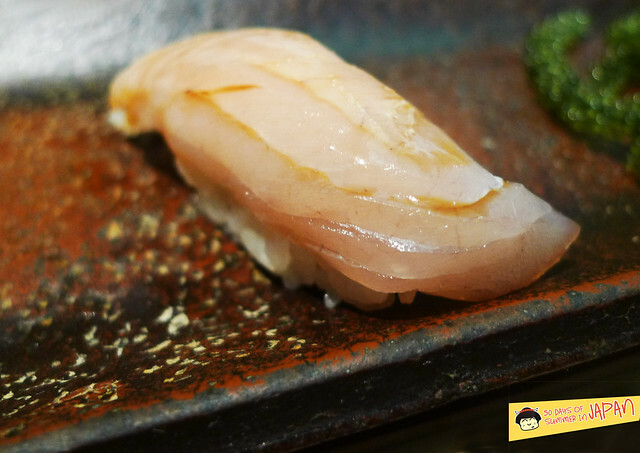 Upon further web search, ChubbyHubby (just a coincidence on the Chubby part) declares Keiji Nakazawa as “The best sushi chef in the world.” In his detailed post, he clarifies that the chef didn’t kick anyone out per se, but simply pointed out the inspector’s lack of sushi knowledge. Ouch! 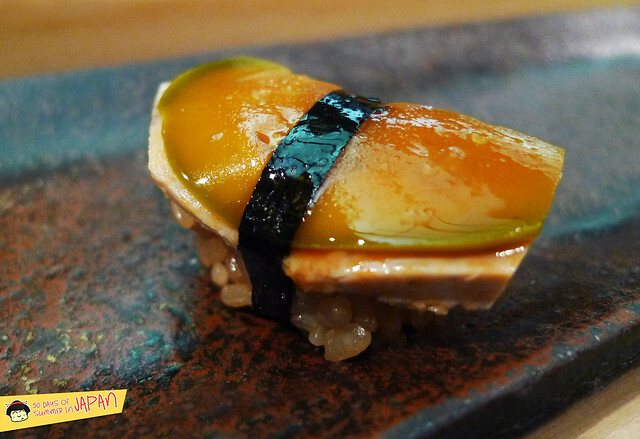 By dissing the Michelin man, Sushi Sho isn’t on the guide, but who cares! This was the best sushi experience I’ve had yet. Due to my lack of Japanese, I begged the front desk lady from the adjacent building (we don’t have concierge in our apt.). She reluctantly agreed and we had our reservation 3 weeks in advance, just in time to celebrate StalkerBoy’s birthday. Tucked in a small alley in Shinjuku without any English sign, we were lost as the dot on our Google map stood still. 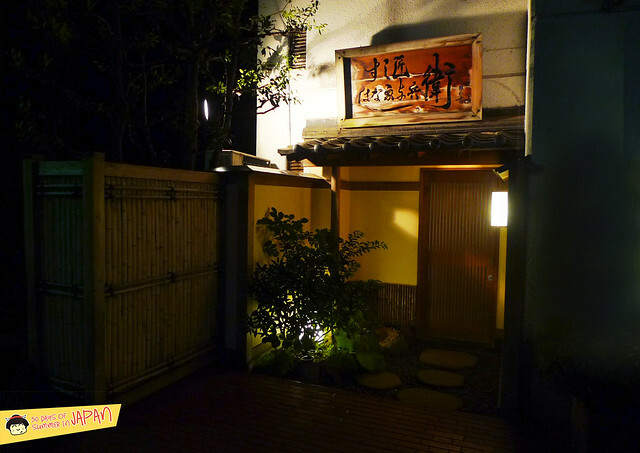 I carefully pulled open the wooden door and worked up the courage to ask “Sumimasen, Sushi Sho?”, the response was an echoing “hai…” in multiple friendly voices, setting the tone for the evening. 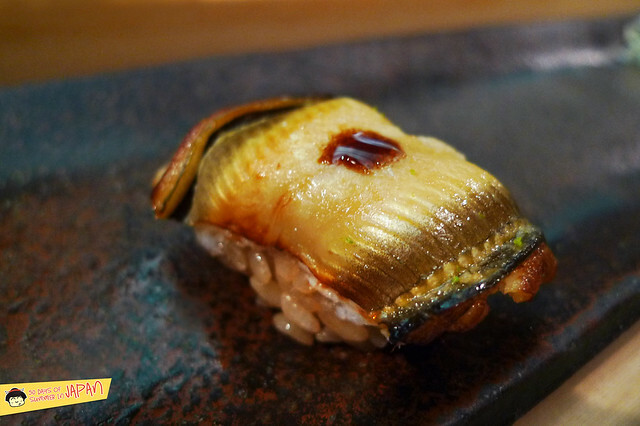 In his 10 seat restaurant Sushi Sho (Sho is Master in Japanese), chef Keiji Nakazawa gloriously and masterfully serves up Edomae style sushi. 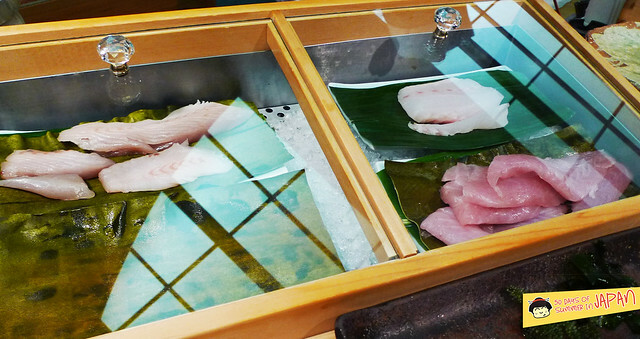 He has played a big part reviving this technique where fish is aged, some for up to two weeks. The idea of aging fish baffled me. 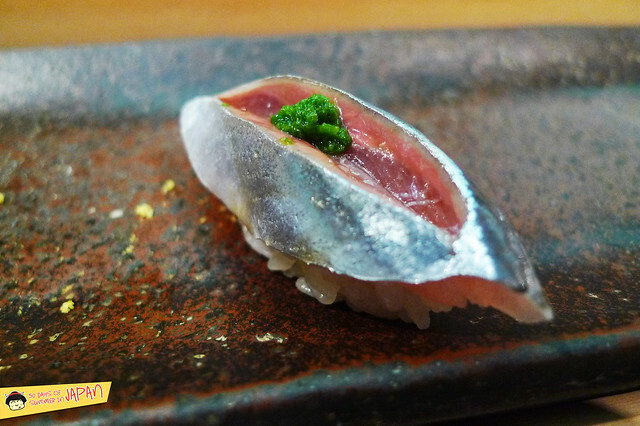 Isn’t great sushi synonymous with freshness!? 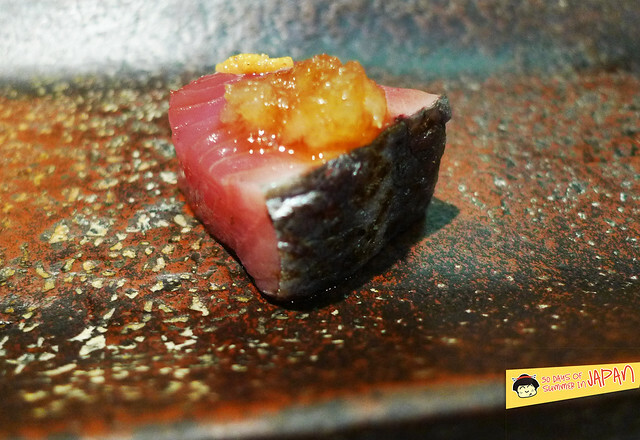 Nakazawa-san proved me wrong a few bites later by bringing out flavors not found in the flesh counterpart. 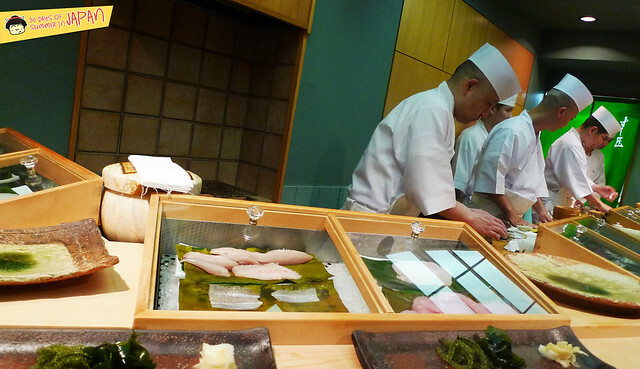 During dinner, they serve Chef Omakase at 20,000 yen (about $200, the exchange rate has been favorable). As with most places in Tokyo, lunch is usually significantly cheaper ($20-30) and less elaborate. We were lucky enough to be seated right in front of the master himself. His English was limited but sufficient for explaining what and how we were eating each precious morsel. There was an air of seriousness, but also harmony, calmness and respect for each other, the ingredients and every customer. Service was very attentive and warm. As the night progressed, Nakazawa-san and his apprentices made jokes here and there. Being able to communicate during a meal like this really makes a huge difference. Though some names of the fish were lost in translation, forgive me, we tried our best. Sparkling Nigori to start our much anticipated meal. 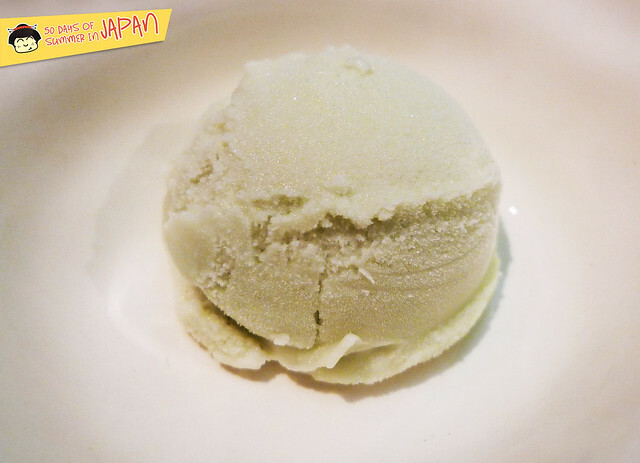 Deep fermented flavors with a hint of sweetness and bubbly. We’ve never seen these before. 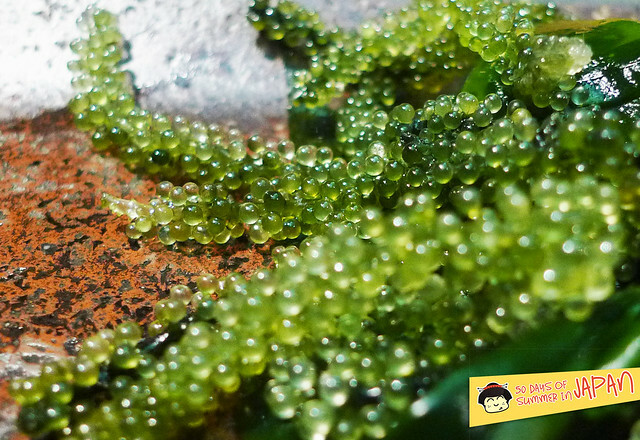 Roe like, it tasted of seaweed, though the texture couldn’t be further apart. Each little crunchy pop was a mini splash from the sea. 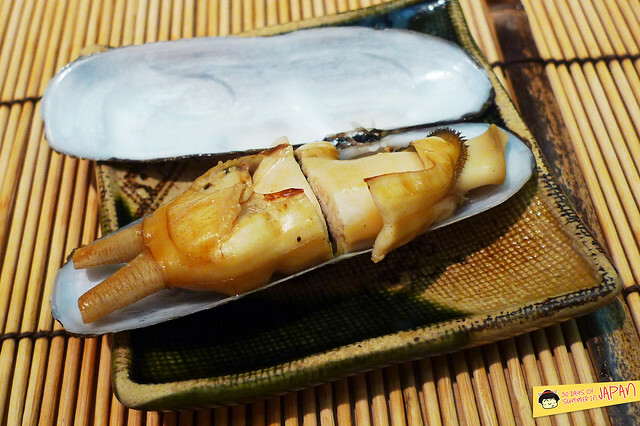 Served with ponzu dipping to add flavor. I forgot what these were, and didn’t write anything down. My mesmerizing moment with the above sea grape might have been to blame. So sweet. The citrus and wasabi really opened up my senses. So tender and not chewy at all. Warm rice in the center. 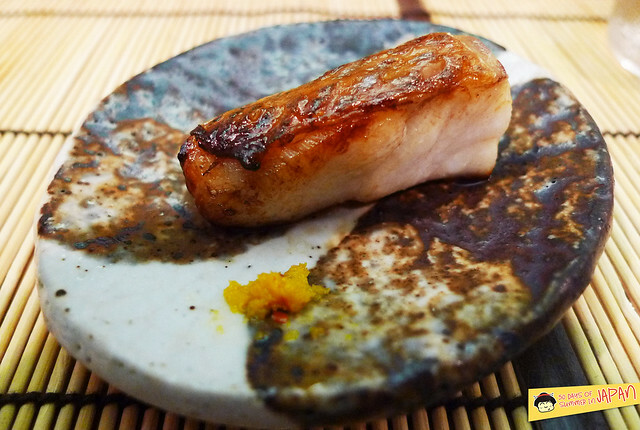 Usually fish served with skin have a bit more fishyness, but the ginger and shiso leaf brighten up the oily bite. Melt in my mouth like the fattiest of tuna, only softer and more tender. One word, fantastic. 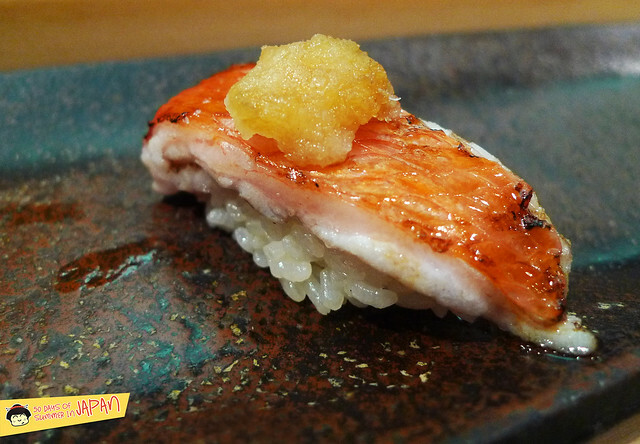 Perfect match of meaty fish and that sweet/tart onion on top. The intense flavors lingered for a while. 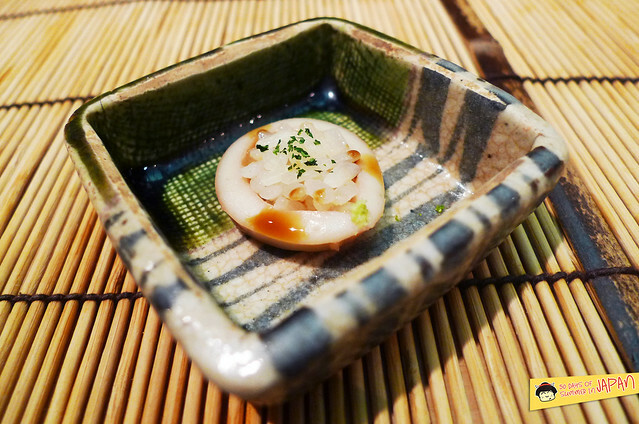 Before this piece, I haven’t had squid that wasn’t chewy. What a contrast. This was so sweet, soft and incredibly tender. Aging does squid good. I’m guessing like beef, it tenderizes it. Sweet with a little soy. Bouncy and chewy without being rubbery. Skillfully crisscrossed pattern. This was like perfume, if perfume was edible, in a mild way of course. I never had anything like it. I wrote down what the Chef said, but upon further research, kiss fish seem to reside in aquariums? Say what?! Regardless, it was an unforgettable mouthful. 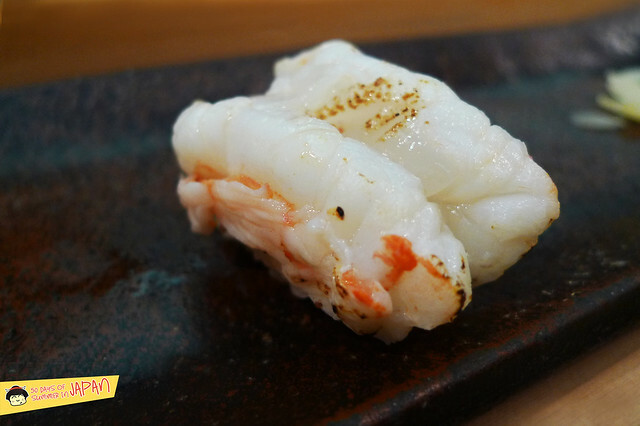 I’ve never been a fan of cooked ebi, but this changes everything. So sweet with a bite to it, the texture was almost like lobster. Head roe made into powder, how genius! I hate it when it goes to waste. Sesame flavored seaweed wrapped around sweet and vinegary fish. Not salty or fishy as I first suspected. Soft flesh with a snappy playful texture. The green onion “relish” added a great bright flavor. The egg sack stuck together. Soft and delicate to the touch, this was fishy in the best way possible. A burst of salty and oily pops. Not as fatty but very flavorful. 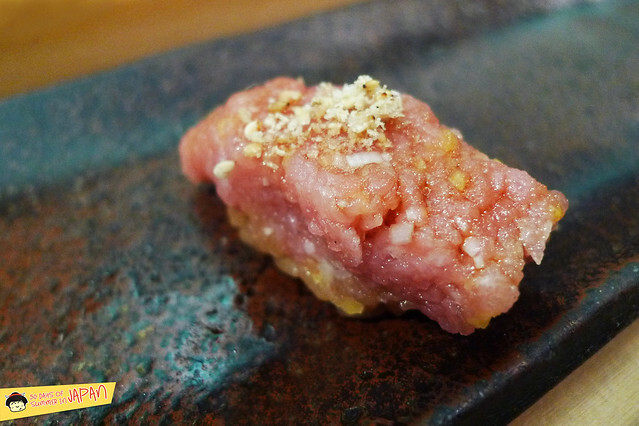 A perfect balance of meaty with a light brush of soy. I see what he means about bringing out the flavor of the fish with his aging techniques. 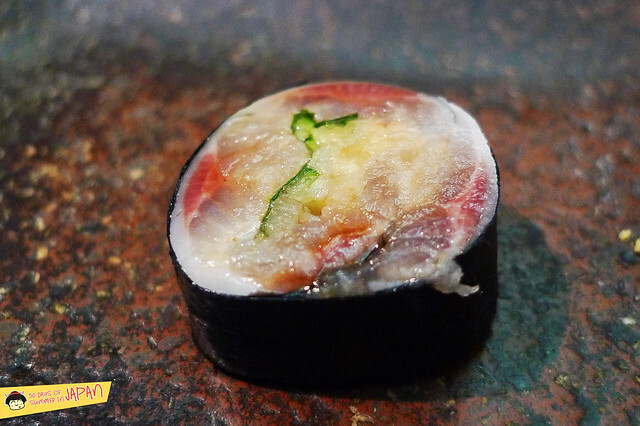 Tuna will never be the same again, heck, sushi will never be the same again, period. Sweet like candy, seriously. With a beautiful yet subtle sprinkle of citrus peel. So sweet and creamy. 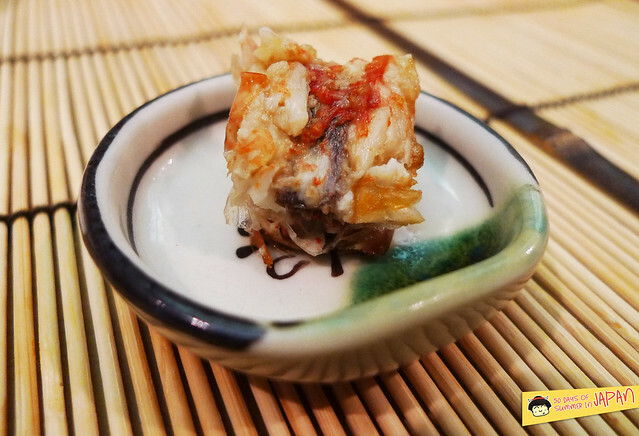 The deep rich flavor was as good as hairy crab roe. The rice is brushed with soy and a pinch of sea salt made it one dreamy mouthful. This moment called for closing my eyes and smile. I felt loved. OMG! I don’t mean to go all valley girl here, but OMG. Amazing. Crispy on the outside, an explosion of oil so fragrant, it will most definitely be remembered for the rest of my life. No bite has ever given me such elation. 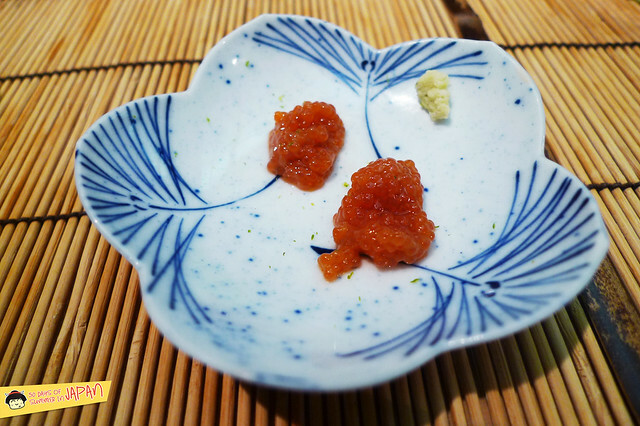 Melted on my tongue, the spicy yuzu gave me a tingle with a fruity burst. Wow. Sweet bright sea aroma. Tender crunch texture so particular, the only fair comparison would be tender tripe. 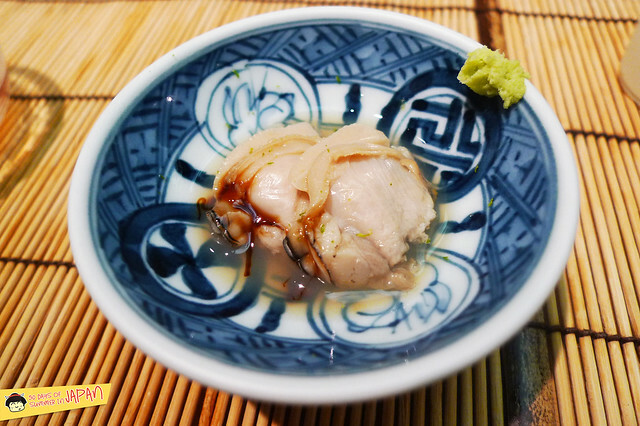 Therefore, I name it “tripe of the sea”. Meaty and torched to smokey perfection. So tender and sweet. 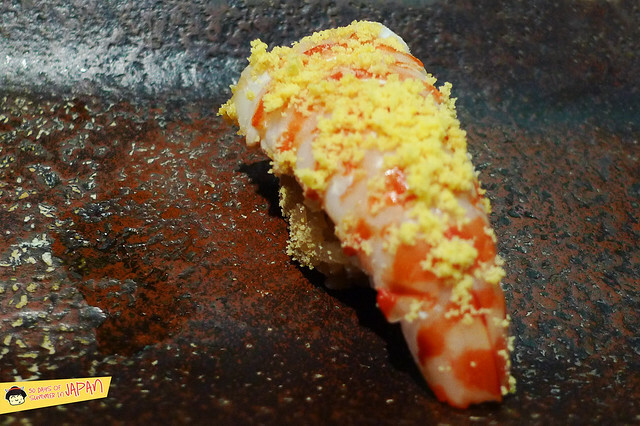 Prawns in Japan are fabulous and this did it justice. Now we were really talkin’. Smokey, creamy sweetness. Umami to the power of ten. 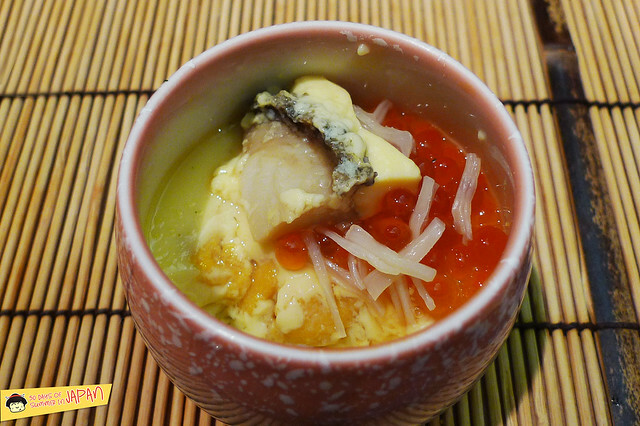 Smooth egg custard with strings of salty scallop. 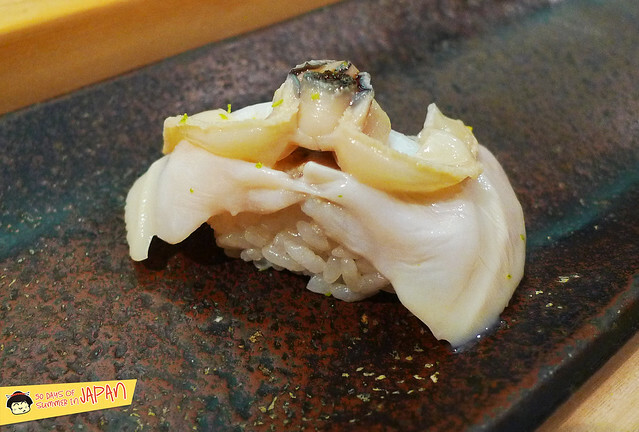 A nice piece of tender but toothsome abalone. Great plays of texture with a hint of smokiness. 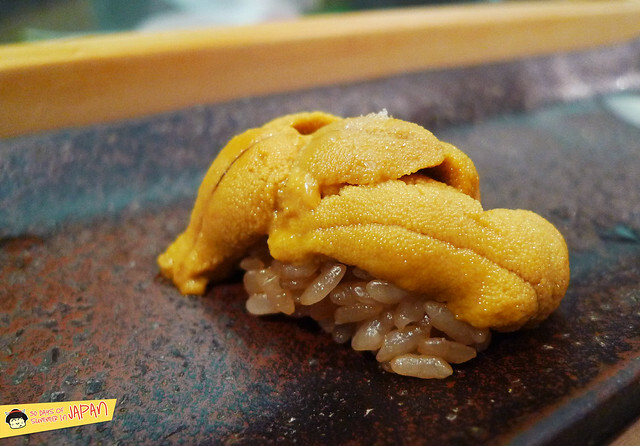 Obscene amount of sweet uni on the bottom, the salty ikura (salmon roe) pops balanced it all. So succulent. The chard melt in my mouth piece erupted with an oily umami that coated each grain of warm rice. Another winner of the night, though everything was truly spectacular. 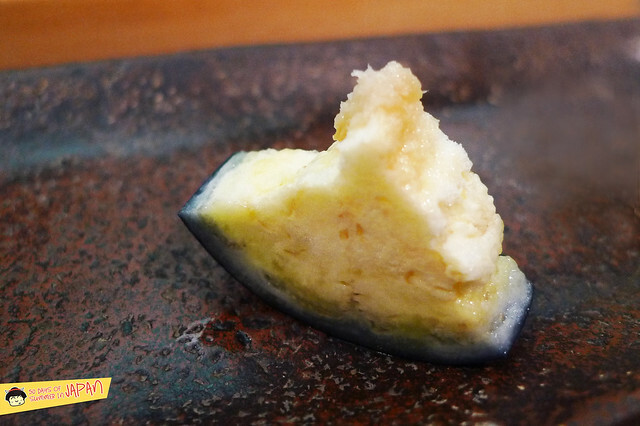 Crunchy, slightly sweet and tart fruit “pickle” contrasting the creamy foie gras of the sea. Sweet like unagi sauce. 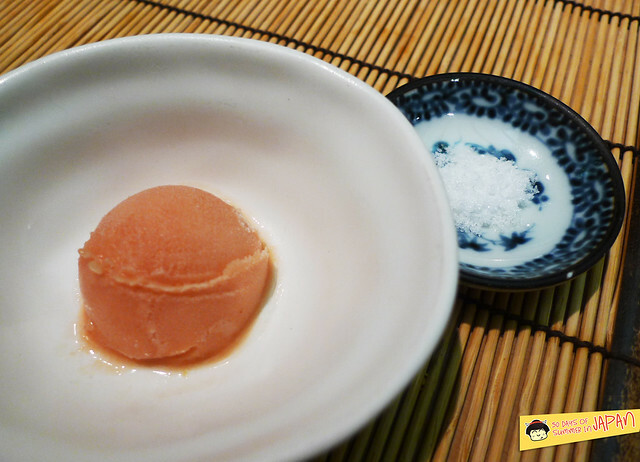 Ohagi are usually rice balls made with glutinous rice. This savory version had chopped fish that almost taste like soft and tender minced meat. An onion pickle and sesame topping. StalkerBoy closed his eyes. I think he made a wish for more on his next birthday. Chard crispy edge, very soft and buttery center. Not overly sweet, so natural flavors were center stage. All good things come to an end, ours ended with a broth that tasted like all the shells in one pot. 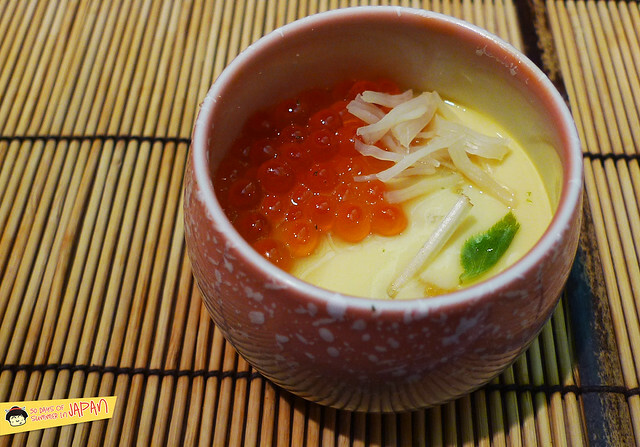 Clean and sweet way to finish the best omakase we’ve ever had. It had all the flavor without being spicy, except for a faint after taste. I asked how they made the flavors so intense yet kept that burn out and they all shouted “secret” as we all burst out laughing. So nutty, I wished there were mochi to go along with it. No photos because I was too eager to try it and totally devoured it. Our meal officially ended, but the table next to us ordered the tomato sorbet (we could only choose two flavors and none of us ordered it). 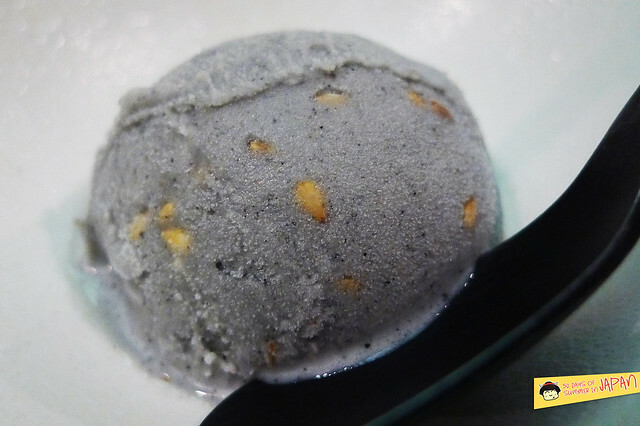 However, my stare and drooling must of been soo obvious that Nakazawa-san took pity on me and asked the waiter to bring me a scoop. Bless him. Concentrated, the sprinkle of sea salt brought out the flavors even more intensely. Sweet, tart and savory. Such a beautiful replica of summer tomatoes from the farmer’s market. Overall, this was an exquisitely memorable meal, worth every single penny. Pretty reasonable considering all the pieces and quality we had. I discovered so many new flavors. Fish I’ve never had or in ways I’ve never been presented. 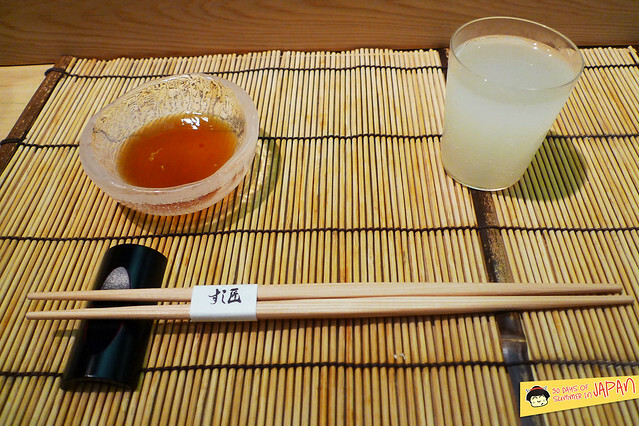 The warm temperate of the rice and their different level of vinegar was individually match to each fish only a true sushi master could. Each grain was distinctively unique, some bites chewier or softer than others. All perfectly paired. Nakazawa-san was an Iron Chef and apparently a great sensei. 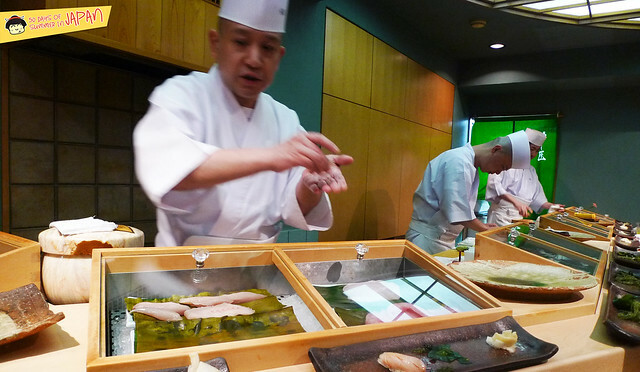 His protoges have gone and opened successful sushi restaurants of their own, which he documents in his book “Sushiya no ningen-ryoku” (The Abilities Behind the Sushi Bar). Though I haven’t been to the infamous Jiro (I read non Japanese speakers are sent to their other location, reservations are overly complicated these days, plus 20 minute meal seems strict) or other big names (will have to try next time), this was by far my best and most unique sushi experience in Tokyo yet, actually ever. Alain Ducasse seems to agree. 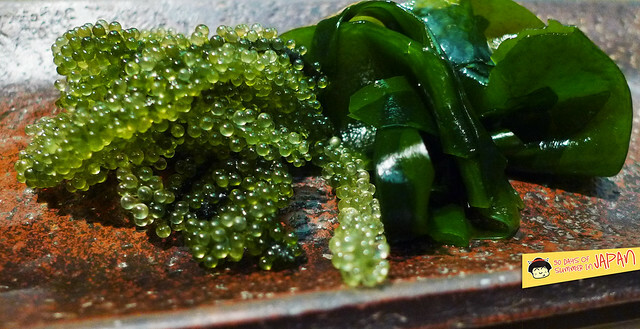 Sea grapes look awesome! And I’m hoping the Kiss Fish you’re eating is different than the one in aquariums … at least the meat looks like they come from a bigger fish … LOL. I was wondering when you were gonna do some splurging and post a high end meal. This didn’t disappoint and looks amazing! I never had sea grapes before, aren’t they cool? It’s a more complete experience than Yasuda. Yasuda is purely sushi while from the blog post you can see they serve more things at 15 East (and I recall you’ve had the lobster before). The head chef is also super friendly and playful. More than however great the food is, it’s always a fun time which makes it so much better. Thanks Kiki, will change it now! Nice post very detailed. I really miss having sushi in Japan. For some reason its not the same here in London! Toritama for their yakitori and chicken sashimi. great post!! 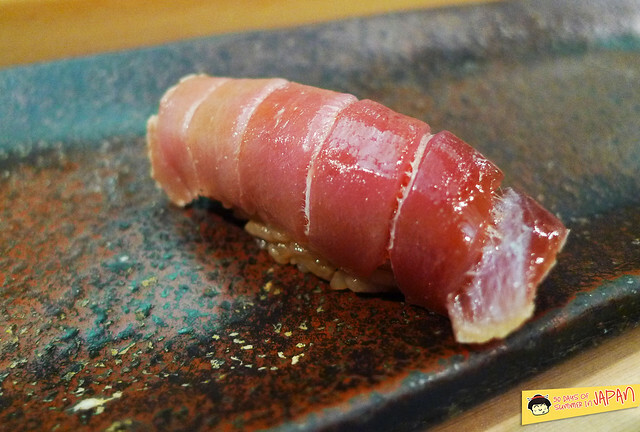 i’m researching which sushi places i want to splurge my money on…this looks like a really good option! how is your japanese? i don’t speak it at all, think i’ll be okay? @stephanie My japanese is non existent but they were pretty good at helping us. They speak a little so don’t worry. 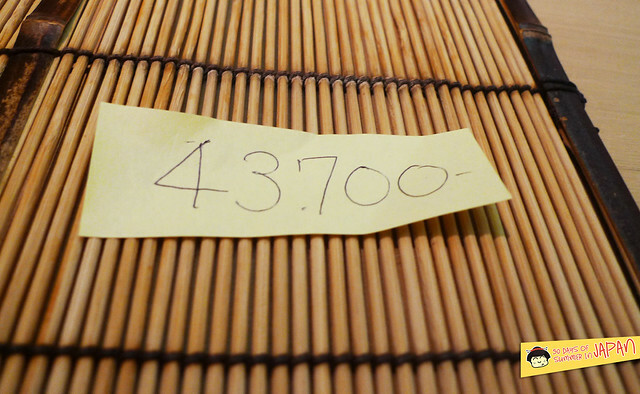 Though for making a reservation, you need someone who speaks japanese to help you for sure. Hi! 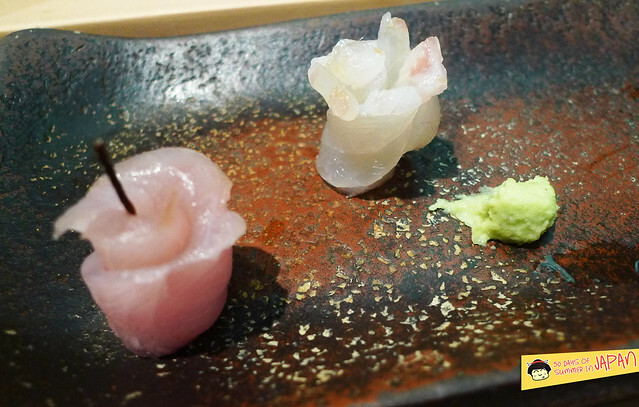 I’ll be going to Tokyo next month and would love to enjoy at least one dinner at a top sushi restaurant. I read that quite a number of chefs like to make their sushi rice slightly saltier than the sushi we get from normal restaurants. 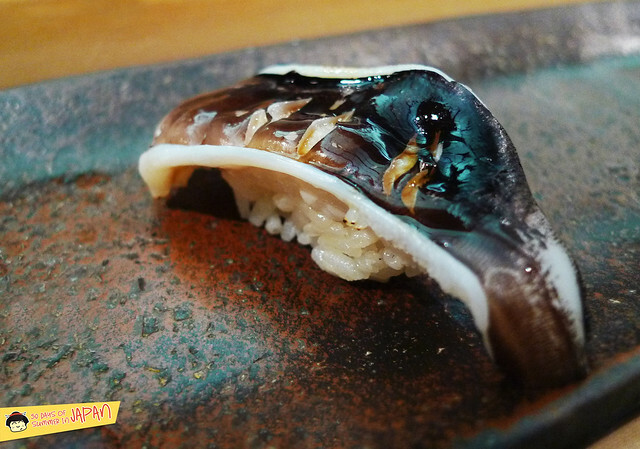 I have personally tried it at one of the restaurants and unfortunately, I am not very used to salty sushi rice. Would you have any suggestions on a safe option for me? Sushi sho looks really really good. May I know if the rice is on the salty side? Nice if you can afford it! Ain’t many but the most well heeled Japanese going in there! 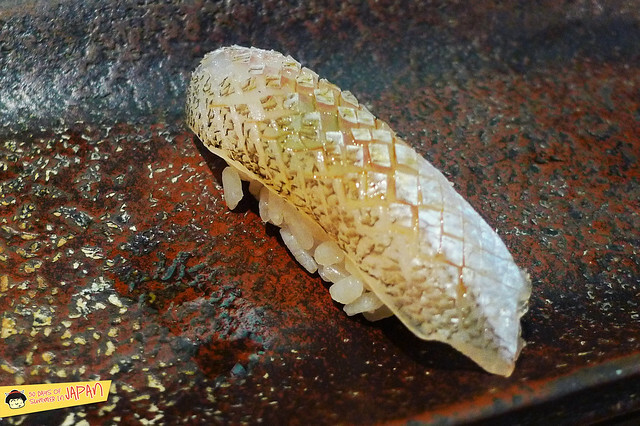 When people learn that once your local seafood is used exclusively, your local sushi will become its own great sushi. Put on your thinking caps. A lot of Tokyo Bay fish are crap compared to Gulf of Mexico’s bounty and variety. The same goes for many other areas around the world. 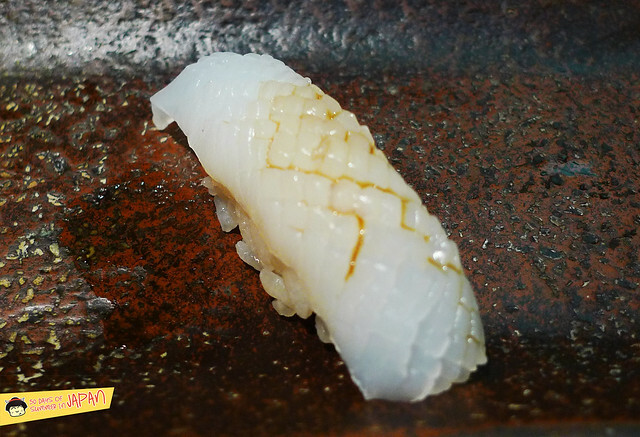 However, sushi is rice, not fish, and the best kome comes from Japan , mostly in the north ,with cool, not cold nights in August. If you pay me $500, I’ll make you sushi that would make you proud to be American. Don’t get me wrong, the best is made in Japan but look what you paid to go there just to eat. I have been making it for 25 years in different places with the fish I caught myself, vegetables I grew myself , serving boards I made myself and I can assure you that good sushi is to be found everywhere once it is made correctly. 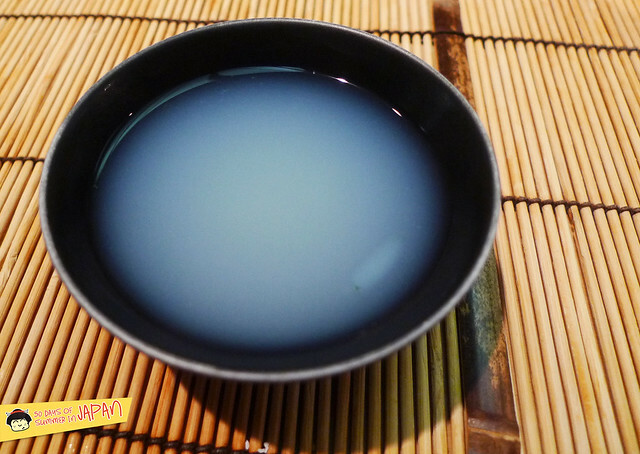 Get off of the ” Edomae” and go with where you live “Mae”. Please stop flying yellowtail around the world. 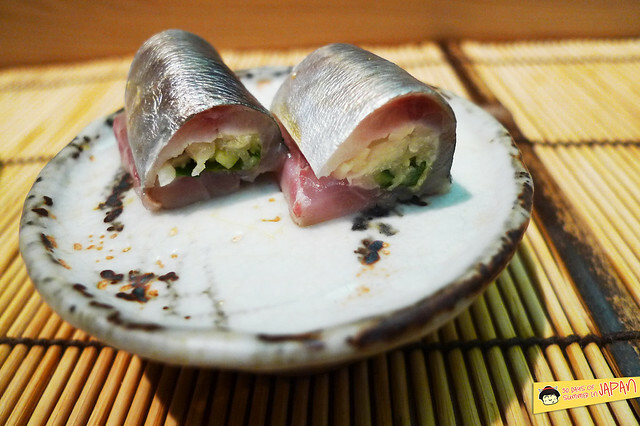 Almaco jack blows shima aji away. Florida pompano is the best sushi dane in the world.I won’t even mention all of the shellfish.Your “kiss” fish is a “kisu”, which is a Japanese whiting. Our ” whiting” in the Gulf are not true whiting but a croaker. In the fall the big ones with roe are different, but no less delicious. We have shun here as does everywhere. It is our duty to discover and utilize our local resources. I’m no chef but I’ve been doing it for awhile. By the way, I lived and worked for 8 years in Japan. I at least understand Japanese tastes and sensibilities.